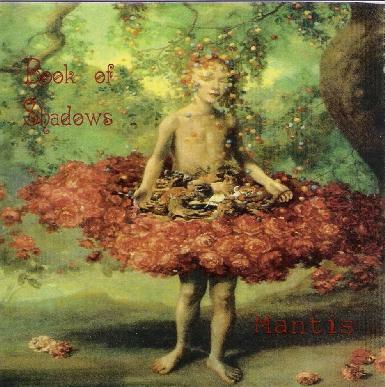 Book of Shadows - "Mantis"
The third Book of Shadows CD follows in the footsteps of last years sophomore release, IndigoM (see AI #31), featuring more of their stretched out space electronic soundscape voyages. The band is now a quartet, with Lori Varga on theremin joining Carlton (ex-ST 37) and Sharon Crutcher and Douglas Ferguson. The CD opens with "The Blue Whale", which is firmly in the classic 50's B sci fi flick soundtrack style and chock full of bleeping and pulsating electronics, howling, soaring theremin and radio static waves. For a few minutes there's also a bit of a Tangerine Dream like sense of thematic development occurring alongside the purely spaced out soundscapes, which makes for a very cool combination. "Angel of the Presence" explores experimental realms, consisting of more alien electronics, as well as quietly harsh guitars, sparse percussive patterns and Sharon Crutcher's haunting space whispers. An interesting mixture of space electronics and avant-garde elements. Other highlights include "Histories of Abandon Canyon", which paints a barren otherworldly landscape that conjures up images of H.R. Giger's alien world. Sharon's vocalizations really add a lot to the ambience and space electronics and really help to give Book of Shadows their character. "Ponder On This" is, on the whole, a more purely ambient piece, but you can tell the guitar is wanting to bust out. It creates tension by starting to rock out, only to recede just before reaching the cusp. A nice melodic-ambient blend on this one. And anyone who digs the total Forbidden Planet electro alien freakout thing will love the 22+ minute "The Escapist", a lengthy cosmic journey with Robbie the Robot as pilot. This is another one that incorporates lots of fun avant-garde elements, voice samples from film or radio, spoken word from Lori Varga, plus other rather intense vocalizations. Lots happening here and the attentive listener will be rewarded. After three releases Book of Shadows is shaping up nicely and really finding of voice of their own. For more information you can visit the Ethedrone Muzac web site at: http://www.ethedrone.com. Email Book of Shadows at st37@ev1.net.